Every organization has its own way of bringing its team together through a shared mission and purpose. That unifying bond among the team at Social Sentinel is rooted in a noble and special mission: to help keep communities safe and to save lives. The induction process when joining Social Sentinel’s team resembles many other organizations: figure out your email address and phone number, get an ID badge, set up a computer, find out where the coffee is, meet new colleagues, etc. Then, after all this, you’re welcomed with something far more unique. Challenge coins have a history traced back through the Renaissance to the Roman Empire where soldiers were rewarded by presenting them with coins recognizing their achievements. More recent history has a young lieutenant during WWI presenting his squadron with medallions struck from precious metals. Challenge coins typically bear the insignia of the organization and are given by high ranking officials to its members or special guests. Challenge coins are most commonly held by teams and organizations that protect their communities to emphasize membership, unity, and morale. Social Sentinel’s CEO, Gary Margolis, is a 20-year law enforcement and public safety veteran and instilled this tradition in our company. Why did he do it? “The Social Sentinel coin symbolizes a connection to our mission, to the team, and to each other. It is the physical manifestation of our commitment to the safety and security of the communities we serve,” he says. The Social Sentinel coin symbolizes a connection to our mission, to the team, and to each other. Team members receive their coin surrounded by their colleagues. Gary welcomes the new member and shares the meaning of the coin. He places the coin in his right hand and extends it with a handshake gesture, passing the coin from his hand to the new team member. Coins are passed with a handshake and it’s important to note that taking possession of the coin comes with responsibilities. It’s called a challenge coin for a reason. A challenge initiates when a member of the team presents their coin and slaps it loudly on a table or similar hard surface. The person(s) being challenged must immediately produce their coin(s) within arms reach, and if they don’t, then they better have access to some cash or a credit card. Losers of a coin challenge are required on their honor to buy the next round of drinks (e.g., preferably milk to go along with the Oreos in the office, but it could be something harder). If the coin is produced, then the challenger is the loser. Careful, though, as challenging a room full of colleagues can get expensive! 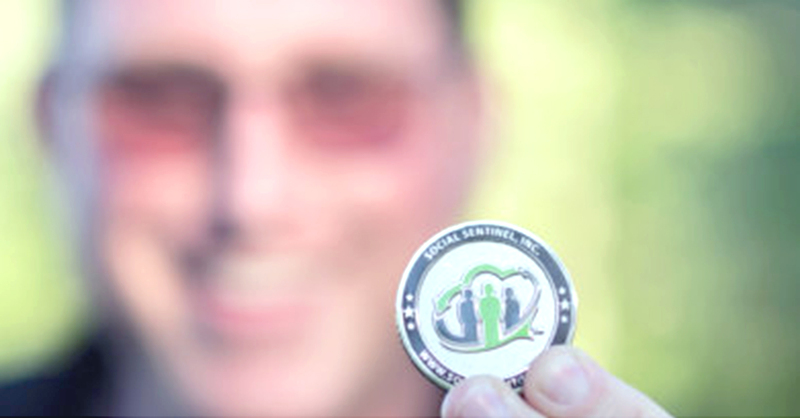 The Social Sentinel challenge coin wanders the world, accompanying team members on business trips, family vacations, solo adventures and the like. 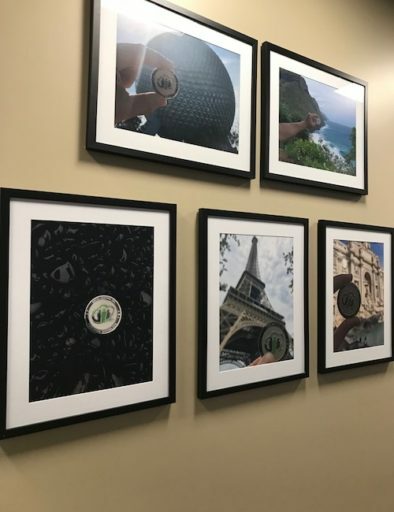 The company’s walls are adorned with framed pictures of the coin featured everywhere from organization headquarters to meetings with state senators, and all over the globe. Its currency is safety, and it truly is priceless.